Call Me Jorge...: Francis gives Italian journalists a tongue lashing, strongly implying that they are “terrorists” and “weapons of destruction” for not being supportive enough of the Moslem ‘refugees’. Francis gives Italian journalists a tongue lashing, strongly implying that they are “terrorists” and “weapons of destruction” for not being supportive enough of the Moslem ‘refugees’. “I have often talked about the rumors as "terrorism", of how you can kill a person with the language. If this applies to individuals, with family or at work, it is all the more true for journalists, because their voices can reach everyone, and this is a very powerful weapon. Journalism should always respect the dignity of the person. An article published today or tomorrow will be replaced by another, but the life of a person unjustly maligned may be destroyed forever. Of course criticism is legitimate, and I will say necessary, as well as the denunciation of evil, but this must always be done respecting the other, his life, his affections. Journalism can not become a ''weapon of destruction" of people and even nations. Neither does he have to feed the fear in front of changes or phenomena such as forced migration by war or hunger. From 2015, Libero an Italian newspaper’s headline reads, “Attack in Paris: Islamic Bastards”. 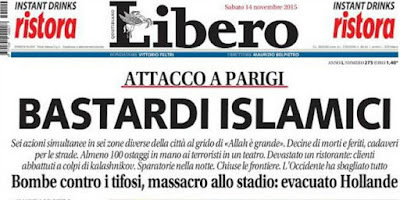 The newspaper was sued for using this language and it is the type of article Francis was criticizing in his address to Italian journalists. Anyone who supports Jorge and/or the Novus Ordo deserve what they receive from the Zionist Talmudic Anti-Pope. Secondly this is going to become more common. The Zionists aren't going to allow the White Race to defend their religion and homeland.